This review may contain spoilers. If you don't want to see spoilers about Beyond Carousel, get to your nearest indie bookshop, buy a copy, read it and then come back and talk to me about it in the comments. If you've read it, or spoilers don't bug you, feel free to read on. When we last left Nox, Taylor and Lizzy at the end of Carousel, they'd finally managed to make their way out of the shopping centre which had imprisoned them for eighteen months. Now, living in a deserted, post-apocalyptic Perth with no power and limited clean water and food, they're starting to think that maybe they were better off where they were. Still, outside the confines of the centre, the trio are slowly starting to piece together what may have happened to everyone else. The arrival of a Danish filmmaker, Tommy, to the property in the Perth hills where the gang are bunking down alerts them to some strange coincidences. First of all, they're not the only ones who were trapped. And second? They're not the only artists. 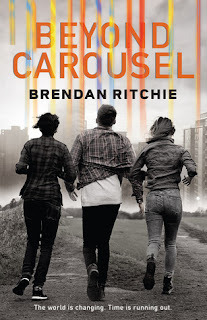 In fact, the art connection had begun to be revealed at the end of Carousel, but in Beyond Carousel, Nox and his friends (Canadian rock duo and twin sisters Taylor and Lizzy-- perhaps modelled on real-life band Tegan and Sara?) realise that all over Perth, artists from various disciplines have been sequestered in Residencies, only able to leave once they've produced something great. So where to next, they wonder? Lizzy wants to go to the airport, to solve the mystery of the Air Canada flight which roared over them while they were staring out of Carousel's domed ceiling. Taylor wants to follow a girl she met on Boxing Day, a girl who Tommy says may be in the city. Nox isn't really sure where he wants to go, but he doesn't want the group to split up. Plus, now that Tommy's told them about the existence of someone known as The Curator, he thinks maybe he has a chance of finding out what really happened to everyone from his life before. Set aside your sceptism about the possibility of Perth turning into a hotbed of artistic production in the current political climate, because the world created by Beyond Carousel is satisfyingly compelling. Nox sees the world through a storyteller's eyes, and his doubts about the legitimacy of his position as one of the 'Artists' will be familiar to anyone who has ever tried to create something. There are more than just a few echoes of John Marsden's masterpiece Tomorrow, When the War Began in this book-- from the coming of age story set against a changed home landscape, to the importance of remembrance and writing things down, I found myself thinking of Ellie Linton more than once. While the writing style in this book is a little more on the simplistic side compared to TWTWB, I think therein lies one of it's strengths-- this is not just a book for avid readers. This is a book which reluctant readers will pick up and love and relate to. It's a book about friendship, self discovery, survival and art. Ritchie's descriptions of Perth are an added bonus for Perthians, as the characters take a tour of our home after the end of the world. From the hills to the Burswood casino, to Victoria Park, to Cottesloe, Ritchie's descriptions (and Nox's observational skills as a character who is a writer) are spot on without being overblown. From early on, Beyond Carousel has the feel of a more confident writer than the book which came before it, and I know we'll see great things from Brendan Ritchie in the future.